I don’t know if anyone has noticed, but we have had our share of complications around here. Yesterday, Zachary’s school nurse called to tell me that his stoma was looking a little different and bigger than normal. It was close to the end of the school day, so he rode the bus home as usual. I peeked at it as we rushed to our next activity and noticed that it looked swollen, as if someone had pumped it full of air. Zack was acting normal, so I figured all was well. When we got home I took his bag off to get a better look at the stoma. Not only was it swollen, it was protruding out from his body. After much crying and talking to daddy on the phone, I finally got Z into the tub and we got his wafer off. I had put it on less than 12 hours before and he was worried it was going to hurt. He was right. Once that wafer was off and he was in the water he started really complaining about the pain. I got him out of the tub and on the floor to assess the situation and then I freaked out! As he was crying the inside of his stoma came out, like a telescope. Seriously. I took a picture and sent his doctor a text. It started getting worse, so I called his doctor. I’m sure he lives for my texts and calls. 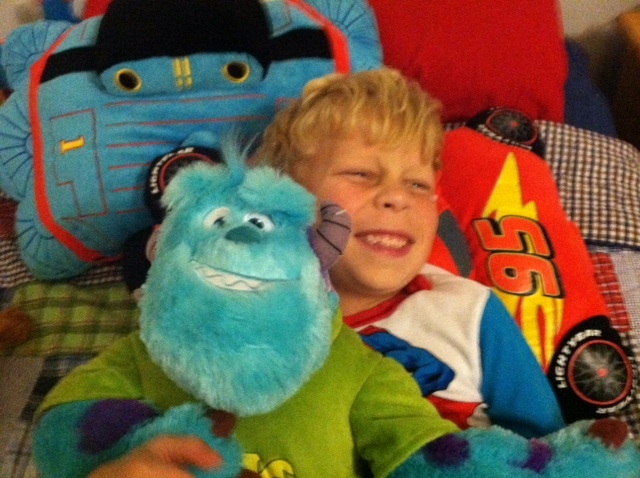 They brighten his day and never interrupt his family time….I’m grateful he is so kind. I’m grateful he loves his job. I’m grateful he actually answers me when I’m freaking out. Happily that has only happened a few times. That’s my story anyway. Zachary’s doctor told me that his stoma was prolapsing. Let me save you from making my mistake – Do Not Google This! He said that he would much rather have a stoma prolapse than a stoma that was too tight. He said that as long as his output was good, the stoma color was good and that Z did not have any nausea or distention or pain, all was well. Of course, at that moment he was in a lot of pain. I gave him some pain meds and his doctor told me that if he did not calm down he needed to be seen. He then told me that I could gently massage his stoma and guide his intestines back inside. WHAT? I did NOT sign up for that in parenting class! Last night I learned how to put intestines back into my child’s body. Ponder that. I can honestly say that this is not something I had on my bucket list. It is not too bad, but it is also not my idea of a good time. The good news in all of this is that a prolapsed stoma is not usually dangerous, just creepy – in my opinion. I hope that Z never knows I think it is creepy. I’m sure I’ll get over it in a couple of days. Another cool thing about Z’s GI is that his wife is also a doctor. She told us that if we put a tablespoon of granulated sugar on the prolapsed stoma, it would shrink and retract. The sugar acts as an osmotic agent pulling the water out of the stoma and decreasing the swelling. It’s like we found a two for one sale on doctors. If Z’s doctor ever reads this (which I highly doubt), I hope he knows we mean this with the utmost respect and gratitude. We are a blessed family and we know it! Zack was all about trying the sugar experiment. He was compliant and excited. He took pictures and even sprinkled the sugar. It reminded me of putting salt on a slug…come on, you know you tried that as a kid! It worked and that was exciting. The only problem we encountered was that as soon as Z stood back up, the stoma came back out. That was a bummer, but at least it shrank in size for a moment. I guess that nothing can really be done about Z’s prolapse. As long as he is feeling well and things are moving along well, we will call it good. I’m sure it will take us a while to get used to this new development. So this family will keep on being grateful that even though this development is not what we would like to see and certainly not what we would choose for Zack, all is well. Let’s hope this is the end of the weirdness! Picture of the day: A blurry shot. I have a nice camera. I just never have it with me. My iphone takes terrible photos…or maybe it’s just me. Jake’s Drama Club sent Z some gifts to help bring him cheer. One of the gifts was this big Sully. Z loves it. I hope you can look past the photographer stink and see the joy this gift brought our guy. Thanks LHS Drama Club! This entry was posted in Prolapse, Stoma by Dawn Penrod. Bookmark the permalink. The fun just never ends, huh?? Have I told you lately you are an amazing mom and doctor??? He’s a pretty amazing kiddo as well, and I bet WILL be a doctor one day! Moms do what they have to do. I never thought (as a teenager) I could be so blase about cleaning up after a throw-up, until I had to do it many times. Ditto dirty diapers. Of course, innards are a somewhat different story, but you still do what you have to do. Glad it’s something you can do for Z. Give him an extra hug from Grandma. And consider yourself hugged, too. You can do this!